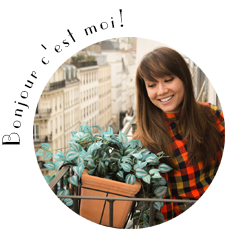 My Parisian Island: 24 Hours in Amsterdam! Amsterdam, one of my favorite cities in Europe! Originating as a small fishing village in the late 12th century, Amsterdam became one of the most important ports in the world during the 17th Century (the Dutch Golden Age). During that time, the city was the leading center for finance, diamonds and was a head of the curve with innovative developments in trade. Now Amsterdam is recognized as the commercial capital of the Netherlands and as one of the top financial centers in Europe. Many large Dutch institutions have their headquarters in the city and it is home to the Amsterdam Stock Exchange, the oldest stock exchange in the world. 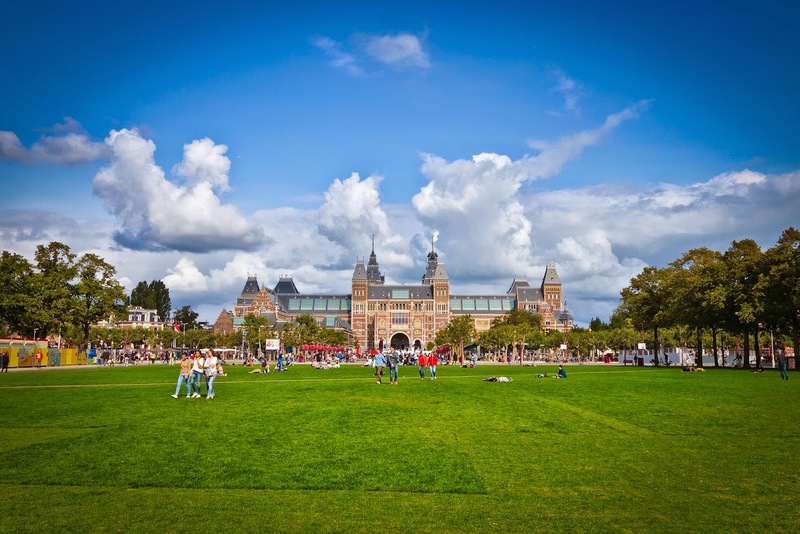 The city is also rich in cultural heritage with many of the worlds top museums such as the Rijksmuseum, the Van Gogh Museum, Stedelijk Museum, Hermitage Amsterdam, Anne Frank House, and Amsterdam Museum, and more. Even without visiting one of the many cultural institutions Amsterdam has to offer, one can spend their time wandering through the historic canals, visiting the many open air markets, shopping (great clothing and design shops), pop into one of the hundreds of cannabis coffee shops or if one is searching for some excitement, the red-light district always has something going on... With so much to see and do, it’s no wonder over 3 million people visit the city a year! I only had 24 hours in Amsterdam so I didn’t want to waste any time. I took a very early train from Paris Gare du Nord to Amsterdam Centraal which takes just over 3 hours. There are about 12 trains a day that run every hour or two from 6:25 to 19:25 from Paris Nord station to Amsterdam Central Station. Train fares vary by the comfort class and how soon you buy your tickets in advance. A one-way ticket starts from 35 euros when you make an early booking. It is up to 130 euros if you make a last minute booking. 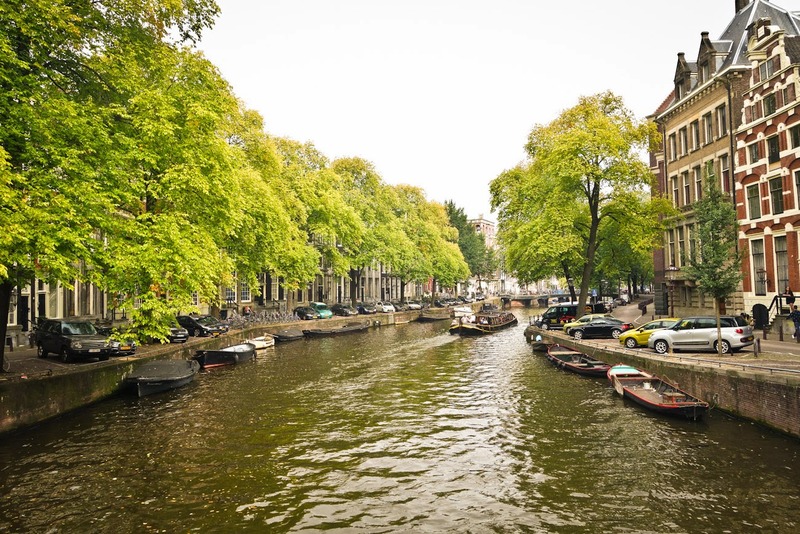 When you arrive in Amsterdam, it is extremely easy to catch a taxi or take the tram to your destination. Here is what I did once I got into town! 10:00 AM: Hop on a bike! 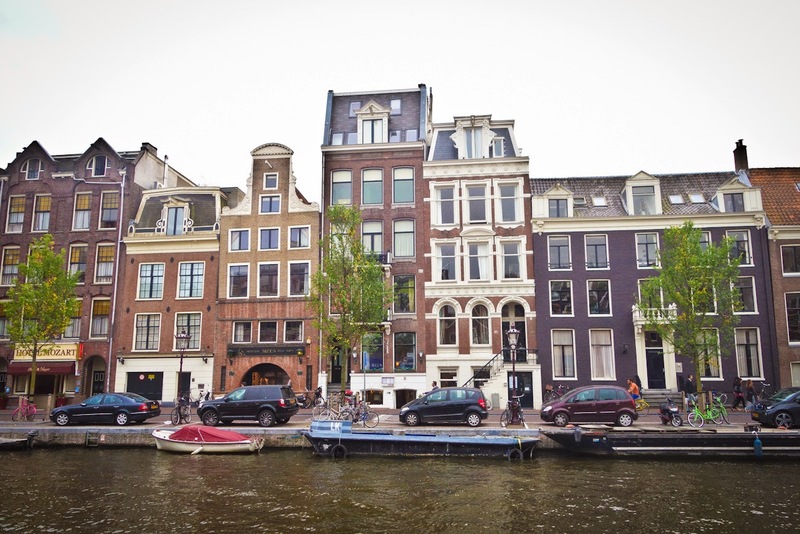 The narrow, winding streets of Amsterdam's historic 17th-century city center are definitely best navigated by bike. And with up to 400 kilometres of bicycle paths leading just about everywhere in town, it's no wonder that Amsterdam is a true cycling city. 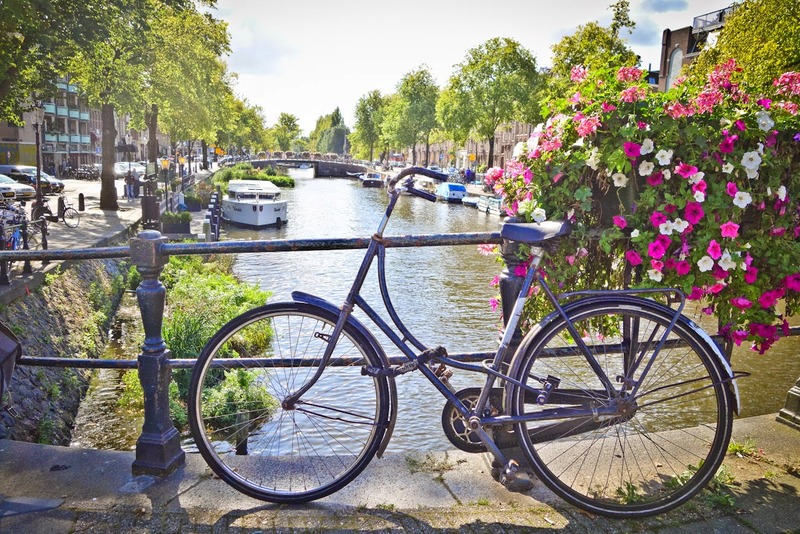 In fact, Amsterdam is one of the most bicycle-friendly cities in the world and the majority of its citizens have spent their lives on two wheels since they were infants. The hotel where I stayed offered bikes to use during my stay so I was able to just drop off my bags and go! There are many places to rent a bike. Alternatively, you can also take one of the many bike tours the city has to offer. Faster and cheaper than public transport, exploring the city on a bike lets you see more in a day, while blending in with the locals at the same time. Plus, if you're inexperienced or nervous about traffic, the expert guides and rental shops can set you up and offer great advice. 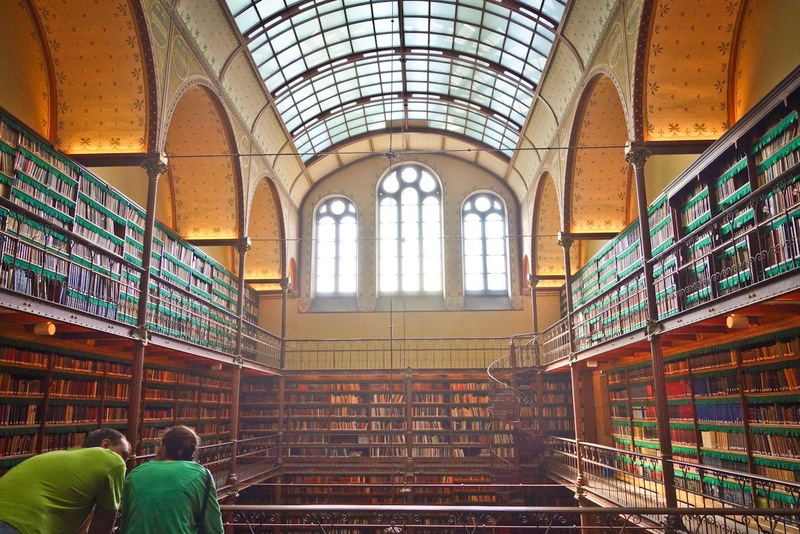 The Rijksmuseum is a Netherlands national museum dedicated to arts and history in Amsterdam. 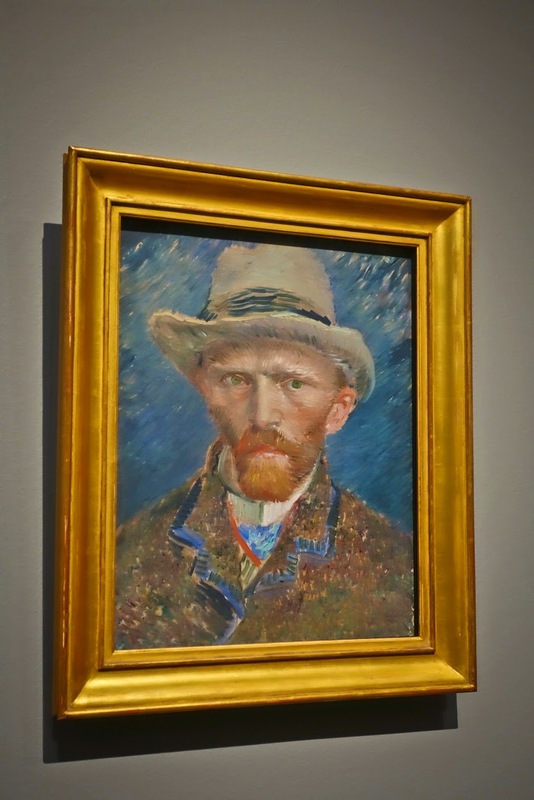 The museum is conveniently located at the Museum Square in the borough Amsterdam South, close to the Van Gogh Museum, the Stedelijk Museum Amsterdam, and the Concertgebouw. 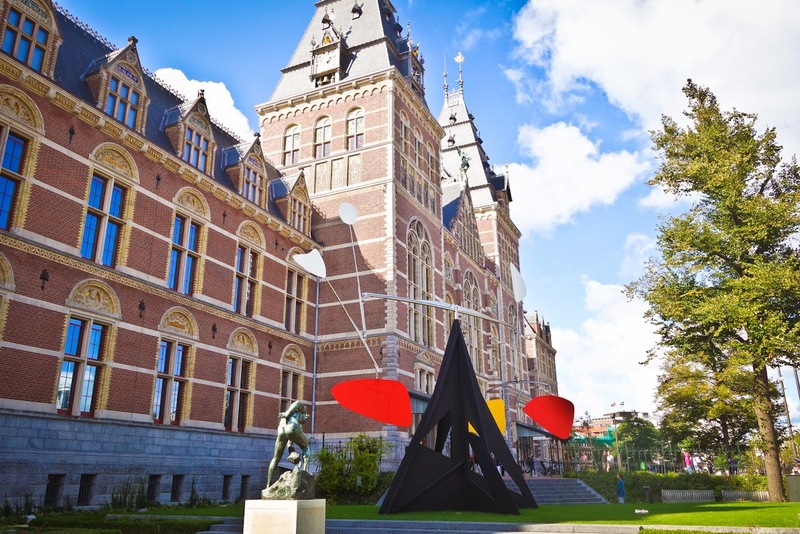 As a national institute, the Rijksmuseum offers a representative overview of Dutch art and history. The museum has on display 8,000 objects of art and history, from their total collection of 1 million objects from the years 1200–2000, among which are some masterpieces by Rembrandt, Frans Hals, and Johannes Vermeer. The museum also has a small Asian collection which is on display in the Asian pavilion. The Rijksmuseum was originally founded in The Hague in 1800 and moved to Amsterdam in 1808, where it was first located in the Royal Palace and later in the Trippenhuis. The current main building was designed by Pierre Cuypers and first opened its doors in 1885. In April of 2013, after a ten-year renovation which cost € 375 million, the main building was reopened by Queen Beatrix. In 2013, it was the most visited museum in the Netherlands with a record number of 2.2 million visitors. Vincent moved to Paris in 1886, after hearing from his brother Theo about the new, colorful style of French painting. Wasting no time, he tried it out in several self-portraits. He did this mostly to avoid having to pay for a model. Using rhythmic brushstrokes in striking colors, he portrayed himself here as a fashionably dressed Parisian. A maidservant pours milk, entirely absorbed in her work. Except for the stream of milk, everything else is still. 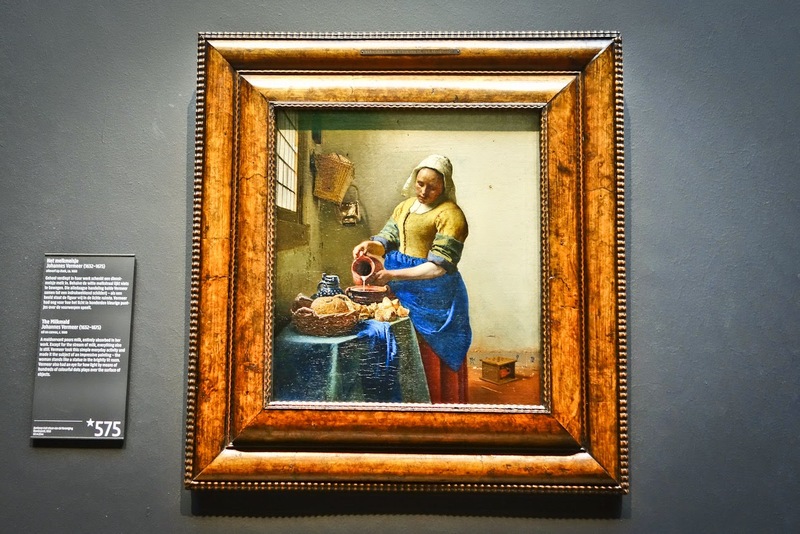 Vermeer took this simple everyday activity and made it the subject of an impressive painting – the woman stands like a statue in the brightly lit room. Vermeer also had an eye for how light by means of hundreds of colorful dots plays over the surface of objects. Exploring the museum and taking-in all the wonderful works of art can build up an appetite. I wasn't quite ready to leave the museum yet so I thought I would have a quick bite in the newly renovated Atrium at the Museum's cafe. 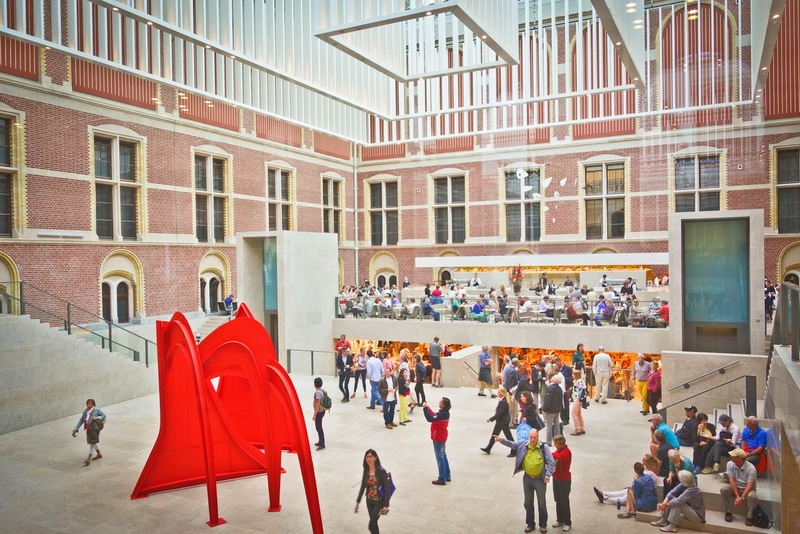 The new Rijksmuseum Café offers eaters a view of one of the central courtyards. One can enjoy an array of sweet and savory Dutch pastries, soups and sandwiches. Non-alcoholic beverages, Dutch gin and Heineken beer are also available. The Café is open 365 days a year from 9:00 to 18:00 for both museum and non-museum visitors. It is not possible to make reservations but the turnover of people is consistent so you are not waiting long for a table (if you have to wait at all!). As a California native one would think I would be use to the presence or ability to easily acquire cannabis, but every time I am Amsterdam its ubiquity always astonishes me. Not only was my hotel within a 10 minute walk from Museum Square, but it was directly across the street from a very lovely coffee shop. Coffee shop De Graal is not your seedy red-light district stoner hang out, but serves up an amazing array or teas, coffees as well as cannabis-- all at very affordable prices. Many locals and expats frequent De Graal. 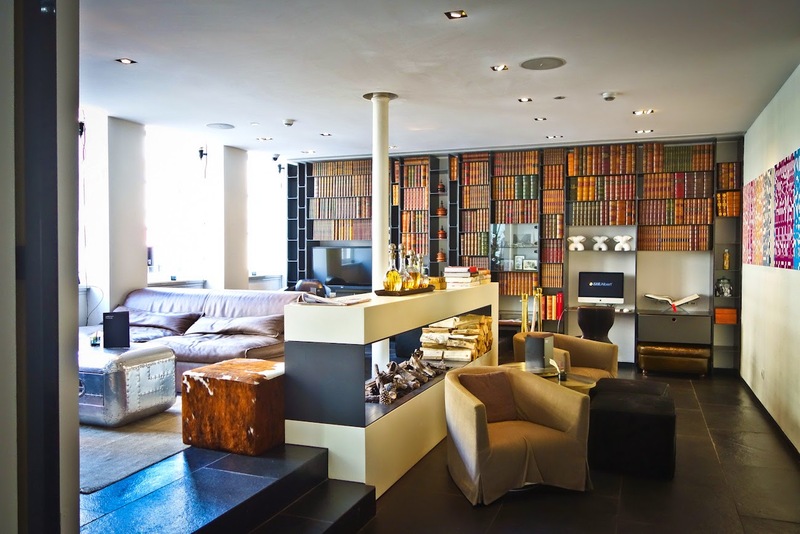 Amsterdam Info describes this De Graal as "a thinking man’s coffee shop". Split over three levels the coffee shop provides customers, board games, comfortable seating, a chess set, great music...and awesome wall murals to set the mood. One unique feature to this coffee shop, is the recording studios for those looking to make some music. Simply call to reserve a spot and the rooms, complete all the equipment you might need, are yours for EUR 5 per person per hour. I guess there is a reason why the Dutch are so happy! Pipes at the ready since 1668! 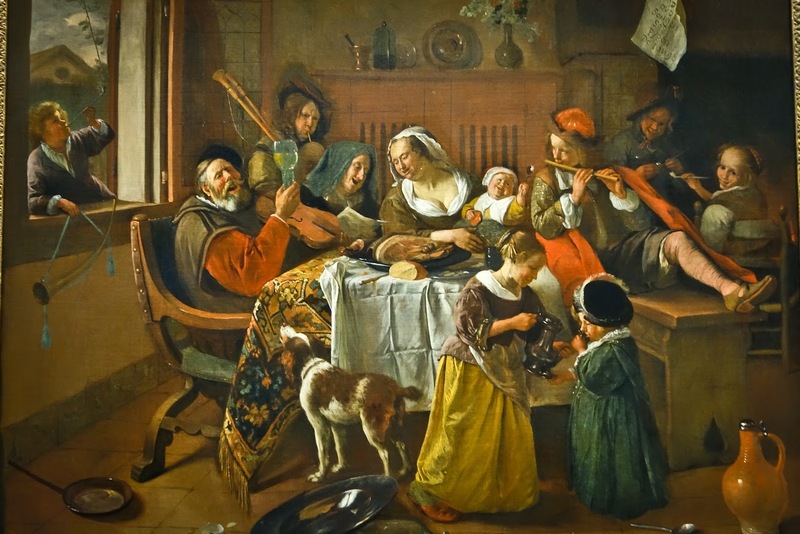 The Merry Family, Jan Havicksz. Steen, 1668. Oil on canvas. Because of Amsterdam's positioning to the sea, its no surprise that one can get amazing sea food in the city, especially oysters. One can typically find Dutch flat oysters however many of the Dutch farming organizations grow Pacific cupped oysters. 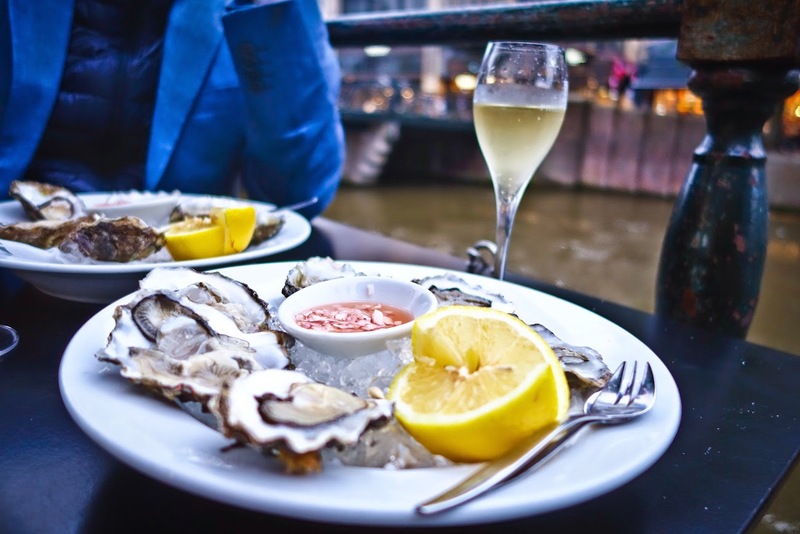 There are many places in Amsterdam where you can find fresh oysters and eat them while enjoying the views of the canals! Oysters are always enhanced with a glass of champagne. 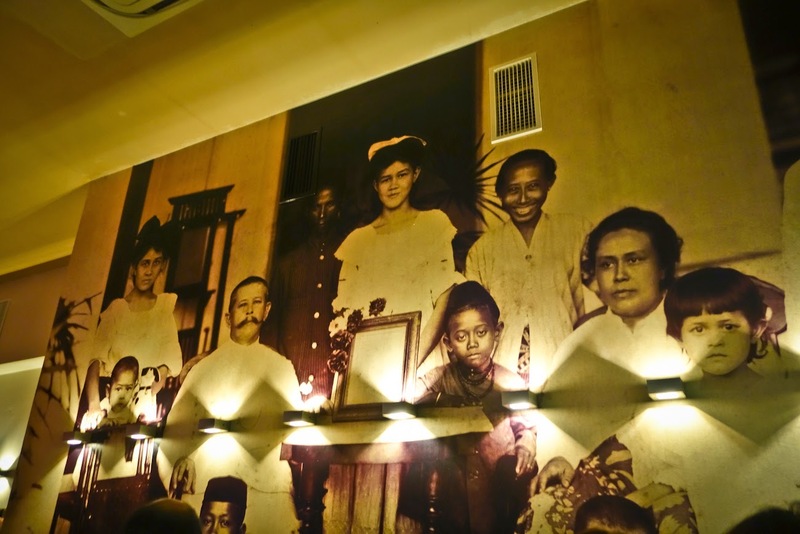 The Dutch colonized Indonesia for nearly 350 years and as a result have a strong tie and history with the culture including its cuisine. 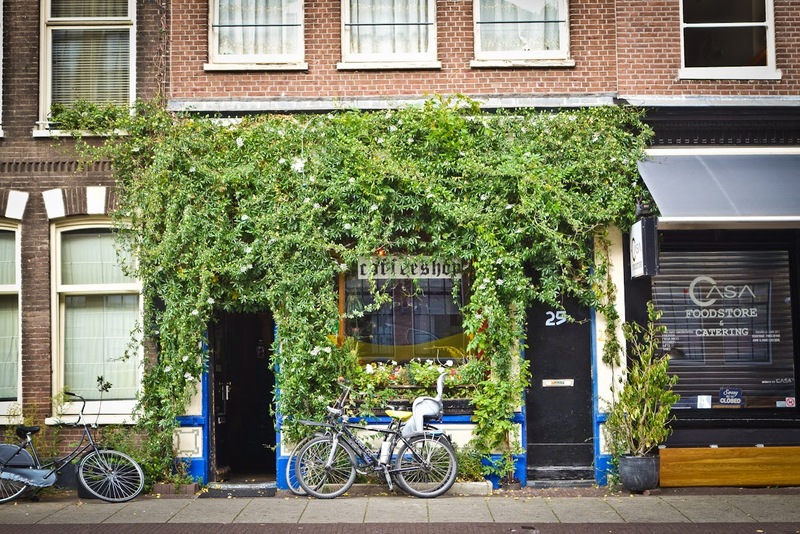 According to a travel writer for the New York Times, an average Indonesian restaurant in Amsterdam is better than the best in the States. So with that said, it is imperative to eat Indonesian while in Amsterdam. 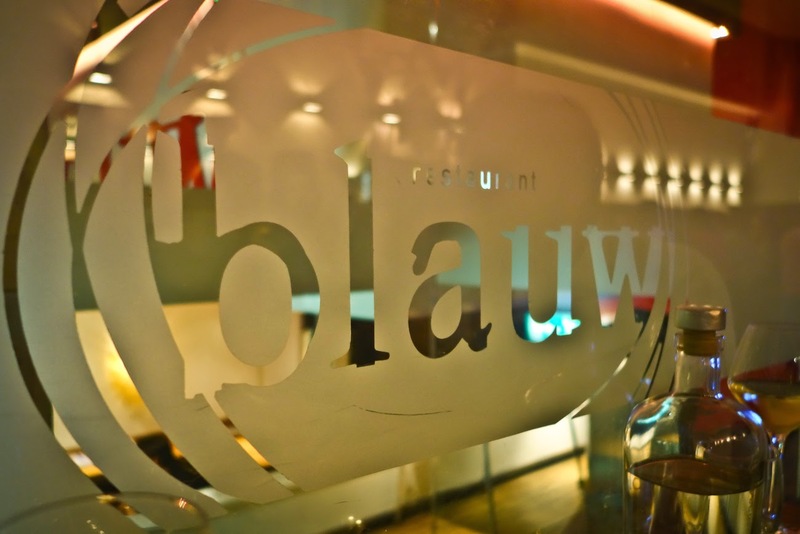 One of my new favorite Indonesian restaurants in Amsterdam is Blauw (which means blue). You can order à la carte but unless you know Indonesian cuisine well you’ll be guessing. 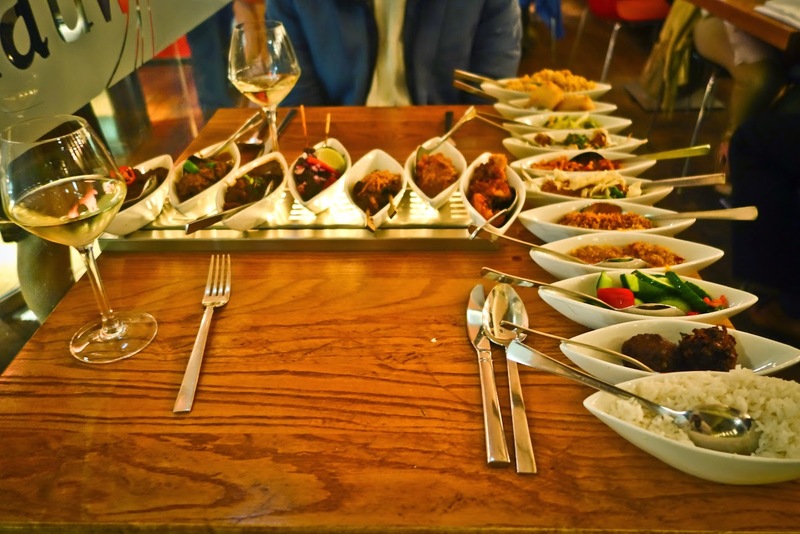 A fun way to try an assortment of Indonsean food is to take the rijsttafel option (rice table). This is an equivelent to a tasting menu. After deciding on whether you want meat or not, you will be presented with a dozen or so dishes, many of which you’ll never identify but most of which you’ll enjoy. If you are a vegan, the waiter will also provide you with different options. The waiter will also take your photo, post it to thier website and you can download it the following day. A super bonus to the resturant is they also have a great wine list! If you opt for the rijsttafel option...come hungry! We decided to take advantage of the wonderful amenities of the hotel and had a late breakfast there. Luckily our hotel, the Sir Albert, offers an amazing buffet style breakfast complete with fresh smoothies, fruit, cheeses, yogurts, healthy toppings, several egg options and the menu goes on and on. This boutique hotel, once a diamond factory in the 1820's, has been re-designed with a very cosy, yet sleek and modern decor thus providing a very lovely atmosphere for breakfast. 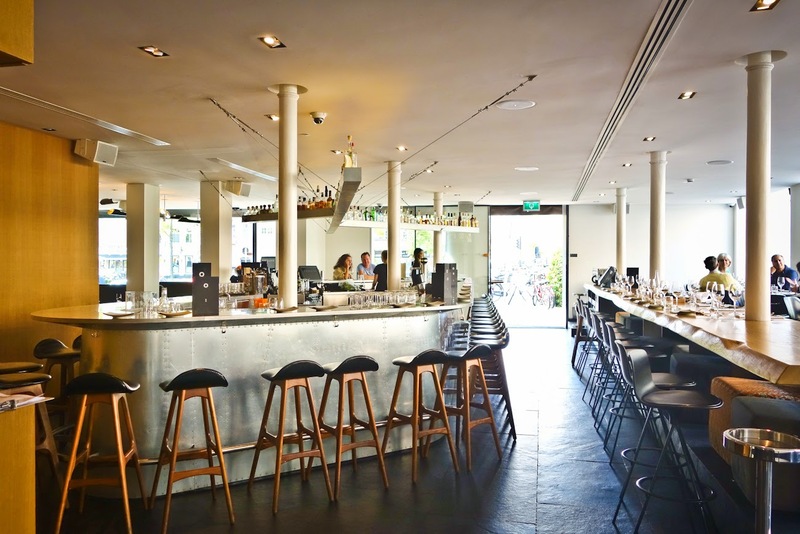 Its breakfast area is near the "library" and has large windows allowing plenty of light (for lunch and dinner this space transforms into one of the top sushi restaurants and hippest bars in amsterdam called Izakaya...reservations to eat required!). And of course if you are not yet ready to face the day, all the delights from the breakfast buffet can be brought directly to your room. 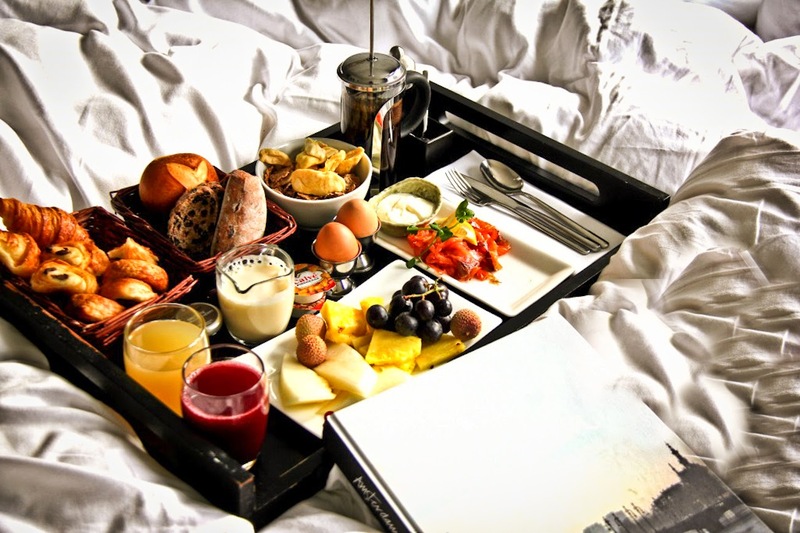 The breakfast in bed option is always a great way to start a new day and a great way to end my 24 hours in Amsterdam!